Mark your calendars for the 2018 "Christmas At The Zoo" celebration!! Admission price includes unlimited rides and visits with Santa. Several food vendors will be offering your favorite carnival foods, such as funnel cakes, candy apples, doughnuts, fried pickles, hot cocoa, and hot dogs. 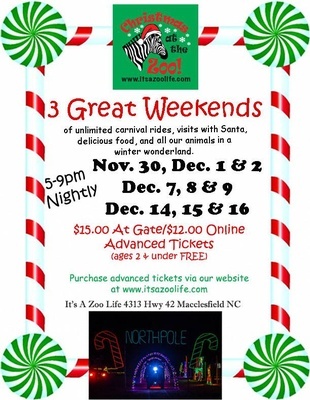 You can also shop Zoo Life merchandise or The Elegant Gypsy mobile boutique for Christmas gifts. $15 admission at the gate/$12 online advanced sales through 11/26/18. Age 2 and under free.